The 1970's ... Greece is under a brutal military dictatorship (the so called "Revolution" 1967-1974). Christmas is walking in a military camp, at Evros (in the extreme cold north of the country, borders with Turkey) and everyone is getting prepared for the traditional celebration. The thoughts, however, of Lieutenant Captain Stephen Karamanides are somewhere else. He is a man closed to himself, never smiles, rough and rugged. He has only one desire: to dance with his secret love, the wife of Lt. Colonel Emmanuel Logos. But he does not know how to dance. He seeks help from a soldier, Lazarus Lazarou, a timid, shy young man, who stands out in the camp as an educated, sensitive and cultured person. The acquaintance of these two men, brief but critical, will be the occasion for a series of events that will culminate with a Christmas Tango ... a day that will change the lives of our three heroes once and for all. 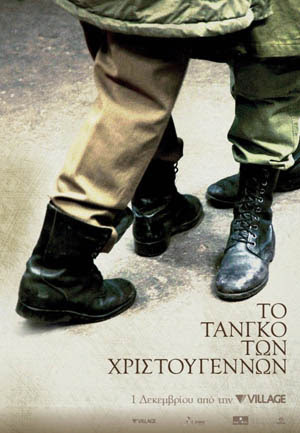 This was a very successful film in my native Greece and it has a small, but important gay sub-plot, towards the end, when the soldier reveals his homosexuality and the rough, rugged Captain reacts gracefully and with kindness to this revelation.